This high back heavy duty ergonomic computer chair from Global features a compound curved, molded memory foam seat cushion that distributes body weight evenly for better circulation and added comfort. Plus, the multiple ergonomic adjustments make these the ideal office chairs for big and tall users, call center workers and healthcare professionals. Other features include properly contoured cushions, synchro-tilt control with tilt lock and tilt tension adjustment, pneumatic seat height adjustment, 360-degree swivel, adjustable height backrest, locking forward or backward seat depth adjustment, waterfall seat edge that helps promote circulation to the legs, height and width adjustable urethane capped armrests, impact resistant urethane outer backrest shell, rated for multi-shift 24 hour use for users up to 350lbs. and a heavy duty five star molded base with dual wheel hooded casters. 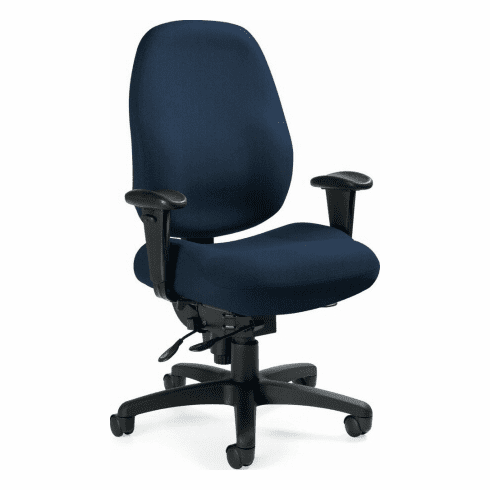 This heavy duty computer chair meets or exceeds ANSI/BIFMA standards. Dimensions: Seat Size: 20"W x 17-19"D. Back Size: 19"W x 23.5 -26"H. Seat Height Adjustment: 17.5 -21.5"H. Overall: 46.25"H x 27.25"W x 25.75"D. Limited lifetime warranty from Global. This chair is custom made and normally ships within 4-5 weeks.